This variety—Castelfranco variegata—hails from the Veneto region in northern Italy. There’s a ghostly white variety, too. Its flavor is enhanced by cold weather, like many hearty winter greens. You can buy seeds from Nichol’s, a local Oregon nursery but they’re currently sold out. Who knew it was so popular? There are many types of chicories, into which radicchios and endives fall, as well as green leafy varieties. While cooking in Puglia in southern Italy, we ate chicories several times—boiling the greens and then quickly sauteing in olive oil, garlic and red chili flake. I was told there were at least 12 types in the region. The bitterness of chicories aren’t to everyone’s liking. 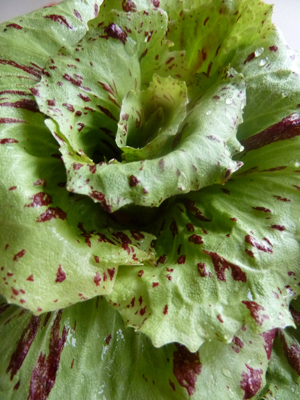 However, this Castelfranco variety is more mild and can add some pizazz to salad. I hadn’t expected to write so much about chicory! But this garden discovery is a good excuse to point you to three excellent-sounding recipes. From Mario Batali, tagliatelle with radicchio Castelfranco, pancetta and caprino. From The Farmers Feast blog, a winter salad of crisp chicories, blood oranges & page tangerines. Scroll a bit further and you’ll find a Caesar salad recipe using all radicchio on the same page. So, on to January’s Fresh Produce Log (high-res PDF). I’m convinced I lost some receipts or failed to write down some purchases. That, or I’ve been eating too much pasta and rice. I had hoped to prove that you don’t have to go without fresh local produce in January. It does exist and it’s easy to find. I kept expecting to venture to the Hillsdale Farmers Market, held every other Sunday in winter. I finally did make a trip the other day and it was like a rebirth. Truth be told, you would hardly know it was January, given the selection available. Because asparagus will distract us in no time, I suggest loving some root vegetables now. One of my favorite things to do is coarsely chop any amount or combination of the following: turnips, potatoes, onions, carrots, turnips, rutabagas. Toss them in a bowl with olive oil, salt and pepper, maybe a few whole garlic cloves. Add some sprigs of herbs if available. Roast them on a cookie sheet at about 375 degrees until tender. The next day, I sometimes puree the leftovers with water or broth and turn it into soup. Doesn’t get a whole lot better than that. Celery root is a ghastly looking thing but don’t let looks fool you. Peel it, chop it and blend it with potatoes for a tasty mash. Also makes a great gratin. Find any gratin recipe and substitute some or all of the potato with celery root. After our phone call yesterday I remembered that I hadn’t seen Jan. yet…was wondering if I’d missed it in some slew of emails…so I wrote myself a note to check your blog…and bingo. Here it is! I better check that seed planting calendar I made – I think I may be behind already…although considering it’s supposed to be 16 degrees tonight…. btw: your fabric flowers look amazing. I seem to be a week behind each month, consistently. You’d think I could simply shift it a week earlier : ) I just got blood oranges to make the one salad. Very excited. Perhaps I can get you to do a guest post showing your calendar?